Do you own a large or small business in Southeastern Massachusetts that deals with metal or scrap metal items on a regular basis? There are tons if different businesses that can benefit from scrap metal recycling in the workplace. Not only does recycling your scrap metal help to prevent these items from ending up in the local landfill, but it also can pay you cash for your recycling efforts that can be reinvested back into your business. On your first visit to Mid City Scrap Iron in Westport, MA, you will likely notice that there is a lot going on. From trucks of customers coming in with scrap metal to forklifts, workers and other machinery going at full pace, it can all seem a little chaotic. All of this work is actually helping to improve our local environment and reduce our community’s carbon footprint with each and every little piece of metal that gets recycled. When you spend time collecting scrap metal and bring it to Mid City Scrap, you can rest assured that your scrap metal items will be properly recycled, melted down and reused by local manufacturers and industries. When you arrive at the scrap yard, you will notice that there are different areas set up for ferrous and non-ferrous metals, as well as for different qualities or grades of scrap metal. The first time you are there it will seem a little confusing, so don’t be afraid to speak with one of our workers for help in getting started. Once you are familiar with the process and how everything works, it will get easier. Regardless of the type of industry you work in, there is always scrap metal waste that can be recycled. If you work in an office setting, there are aluminum cans, plastic bottles and glass bottles that come from the employee lunchroom or office trash that can be recycled. If you work in the manufacturing industry, chances are there is leftover material that can be collected and recycled within your facility. Construction workers, plumbers, electricians, HVAC repair and other professional services all have access to and end up with scrap metal waste that can and should be recycled. Most people – most businesses – usually just throw out scrap metal or items from the workplace that are made of metal, thinking nothing more about it than that it is trash. The point is, much of the metal that is bought, sold and used in this country comes from recycled materials. 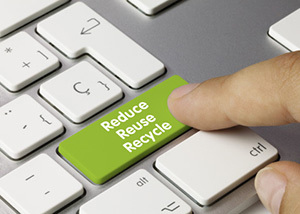 The more we all do our part by collecting scrap metal items and recycling them to be melted down and re-used, the more we reduce the cost for new items that are made from recycled materials. Raw materials cost much more to purchase and use than recycled, so it is in your best interest to keep the chain of recycling going in order to keep materials costs down. In addition to collecting scrap metal to be recycled as a means of keeping the costs for new materials down and lowering the amount of items that end up in our local landfill, there is a monetary reward for scrap metal recycling in the workplace. Mid City Scrap Iron in Westport takes a wide variety of ferrous and non-ferrous scrap metal for recycling and pays individuals, families, business owners and contractors cold hard cash for their efforts. Mid City buys scrap metal items by the pound – or by the ton. So no matter how large or small your collection, you can make good money for your scrap metal right here in Southeastern Massachusetts. We accept scrap metal items from as far east as Rhode Island and as far west as Cape Cod, so no matter where you are in the New England region, think of Mid City Scrap Iron in Westport to get a fair price for your scrap metal items. At Mid City, we purchase scrap metal items from homeowners and business owners all throughout the South Coast region. We buy from architects, electricians, contractors, plumbers and work with a wide variety of industries. Contact us for information on our hours of operation or visit our website for directions to get to our facility. Located conveniently in Westport, Massachusetts, we are able to serve many different cities, towns and communities. Come visit Mid City Scrap Iron in Westport and you’ll soon see all of the advantages of scrap metal recycling in the workplace.